Ben Korman, CEO of Lotus Equities, discusses his firm’s plans for redeveloping the former Newark Bears stadium in Newark. A developer hopes to break ground by some time next year on a project that would bring thousands of apartments to the site of the former Newark Bears baseball stadium, in one of several plans that are now taking shape around the city’s Washington Park neighborhood. Speaking at a forum hosted by the Newark Regional Business Partnership, Lotus Equity Group CEO Ben Korman said his firm is refining its design for the sprawling mixed-use development. Current plans call for an initial phase of around 1,300 rental units within a group of six-story to 10-story buildings, paving the way for what could be high-rises with additional apartments, some 400,000 square feet of office space and a mix of retail and artist space. Korman told attendees that “we would like to start as soon as we possibly can,” adding that the firm is confident in the demand for workforce housing and for cheaper urban living options outside Manhattan. And while he believes the market would support the development in the long run, he hinted that Lotus is now exploring state incentives to get the project started. 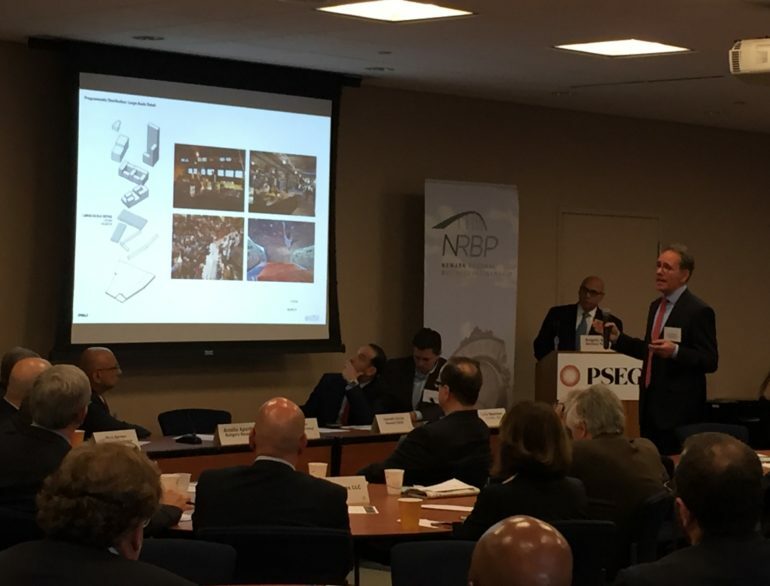 Korman was one of five panelists at the event on Tuesday, which was held at the Public Service Enterprise Group headquarters in Newark, seeking to highlight the development pipeline and efforts to revitalize the blocks around Washington Park in Newark. Military Park, a public space only about two blocks south, has been the focal point of such efforts in recent years, but stakeholders say there are projects in the works that will push the momentum farther north. Arcelio Aponte, a vice chancellor at Rutgers University-Newark, outlined the school’s existing footprint in the neighborhood, including Rutgers Business School at 1 Washington Place and the recently reopened 15 Washington Street. The latter is a 260,000-square-foot historic building that was rehabilitated by the New Brunswick Development Corp. and now serves as a residence hall for some 330 students and Rutgers-Newark Chancellor Nancy Cantor. The university is now slated to move forward with another key project, a 400-bed honors living and learning community at Washington and Linden streets, about two blocks west of Broad Street. Aponte said the project, to be developed in partnership with RBH Group, will help bring Rutgers-Newark students closer to the downtown and beyond what had been an imaginary boundary. Attorney Angelo Genova, who moderated the discussion, said such projects serve a dual purpose of both rebuilding the neighborhood and linking Washington Park to other sections of the city that are undergoing a revitalization. The discussion highlighted not only development projects, but corporate anchors that are helping to drive business in the downtown. Chief among them is Audible, the audiobook giant, which moved its headquarters to 1 Washington Park in 2007 and now offers employees incentives to live in the city and patronize local merchants. Marc Berson, who owns 1 Washington Park and several other nearby properties, said the company has proven to be more than a tenant and serves as an example for other corporate citizens. Audible has also helped found Newark Venture Partners, an early stage venture fund, and is in the midst of its own physical expansion. Tuesday’s panel also featured Carmelo Garcia, executive vice president of the Newark Community Economic Development Corp., and Colin Newman, vice president of public policy and community affairs. Both discussed plans in the city around the Washington Park area. Asked about plans to revitalize the actual park property, Berson said there are conceptual drawings in place and efforts underway to raise funds for the project. But he added that the park “has to be a true destination,” requiring him and others to build support among the surrounding stakeholders, which include residents in the James Street neighborhood, Rutgers and the business community.